Student Magazine Meraki Issue 7 is published! 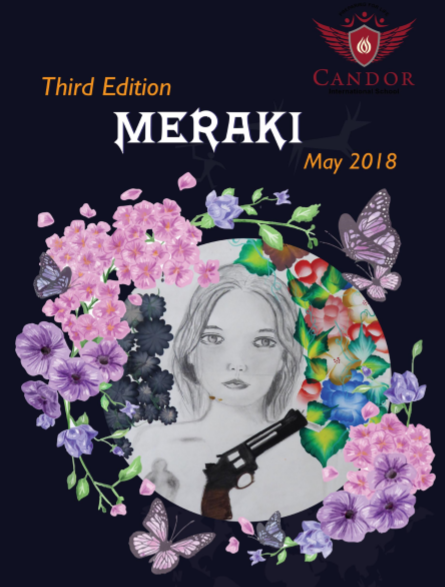 The literature-inclined students of Candor have composed and published their first print edition of Meraki Issue 7! Swathy Natarajan, Risha Papani, Rakshit Jain, Arpita S.K, Sanchita Chopra, Devika Tarek Shah, and Prachi Wadhwa make up the Editorial Board, and displayed great goal-setting and teamwork skills in collating the content for the magazine. Well done, students! Credit for the cover goes to students Devika Tarek Shah and Prachi Wadhwa for the beautiful, evocative illustration they have given Meraki Issue 7. Of course, none of this would have been possible without our teacher advisors Ms. Madhusmita Agarwalla, Ms. Atiya Fathima, and Ms. Aysha Farina, who guided the students, under the management of Candor Principal Mr. Ghosh. We thank the team for supporting the students! Meraki Issue 7 covers a plethora of topics. Fiction, politics, poetry, opinion, technology, and a eulogy are sprinkled across this edition, displaying the variety of interests our students have. Meraki is an avenue we will keep open, for the value it adds to our philosophy of holistic education. At the same time, it makes us proud to give our students a stage on which they can liberally express themselves as they hone their literary craft. Our first print edition is certainly a great achievement, and wonderful showcase of the talent we have at Candor. Read the e-version of Meraki Issue 7.